For many of those who dream of a career working with dogs, becoming a dog groomer is an ideal choice. Not only do you get to spend your time working with your favourite animals and enjoying making them look their best, you can also have the flexibility and freedom of opening your own grooming business in the thriving pet care industry. The pet care industry has defied all expectations and continues to grow, even in times of recession, as pets become more important members of the family and people are more and more willing to spend large amounts of money to ensure that they get the best care possible. It is worth billions of pounds in the UK alone – and with 50% of the population owning a pet, it is a major, lucrative, growing market. There are obviously a range of different careers and pet businesses within the pet industry but for those who enjoy a job that lets them exhibit their artistic side and also enjoy having daily interactions with dogs and their owners, becoming a groomer is a great choice. Once you have gained your dog groomer training, there are a variety of different job options open to you – from working in a pet grooming salon or veterinarian’s clinic to doggy daycare or kennel – or the grooming section of a retail pet store. Ultimately, you can choose to open your own grooming shop or mobile grooming business. The most important thing in your grooming career is getting the right training. It may sound obvious but a lot of people seem to think that just because they enjoy brushing their pets while watching television, they will have enough experience to start a grooming business! To become a professional dog groomer, it is not enough to know how to do a couple of clips for a particular breed – you will need to be familiar with the grooming requirements of dozens of breeds of dogs, both in their show form and in their more manageable “pet form” for the daily needs of most pet owners. In addition, you will need to know which kinds of shampoo and grooming equipment or products will best suit the needs of various clients, depending on their lifestyle. Furthermore, you will need enough understanding of canine behaviour and experience of handling different sizes and temperaments of dogs to be able to not only create the different styles and trims but also to perform the other services that normally come with grooming, such as nail trimming, teeth care, ear cleaning and similar. Therefore it is vital that you invest in the correct training to learn these necessary skills for a career as a dog groomer. 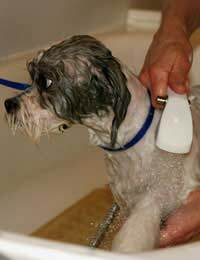 There are several training options for those who wish to embark on a career as a dog groomer. With the increasing popularity of grooming as a career (and use by pet owners), there are now a host of correspondence (home study) and online courses which give you a flexible method to study and gain your grooming knowledge and skills from the comfort of your own home. These courses can vary hugely in quality and content, however, so it is important that you do your homework and ask several pertinent questions before enrolling and parting with your money. Check, for example, the credentials of the person who created the programme – do they run an on-site grooming school as well? And what type of instructor feedback and interaction will you get with the course? While this is a home study course, it should not just be a case of you receiving materials which you tackle on your own but an interactive programme where with an instructor giving feedback on homework and exams. Overall, however, it is felt that you cannot really learn the art of dog grooming without real, hands-on experience and live instructor guidance and for this reason, it is recommended that you opt for training from a “real-life” dog grooming school where you will get both theory and also practical experience from real-life instructors. Just like with correspondence courses, quality and standards can vary so check the credentials of the school before enrolling. Find how many years the school has been teaching the course and the success rates of its students; do the creators of the course own a real-life grooming business and how long has that been operating? See if you can visit the school to observe a class and ask questions of current students. Attendance at a grooming school will usually be required for a number of weeks, although it can often be done on a part-time or full-time basis. Completion of the course should gain you a diploma or certificate in dog grooming. You may also find that the school can provide information on good suppliers of grooming equipment and even help with obtaining discounts. In addition to the official courses, it would be beneficial to gain work experience in as many pet-related areas as possible – for example, such as volunteering at your local rescue shelter, vet clinic or even dog training club – where you will improve not only your dog handling skills but your knowledge of canine behaviour and different breeds. Go to dog shows and make friends with breeders – some may be willing to let you practise grooming their particular breed, giving you both valuable practical practice and specialist knowledge from their own years of presenting their breed to look their best. Remember, ultimately grooming started from the breeders.